This was back in the heady days of cottage-industry software sold by mail-order adverts in the back pages of magazines. 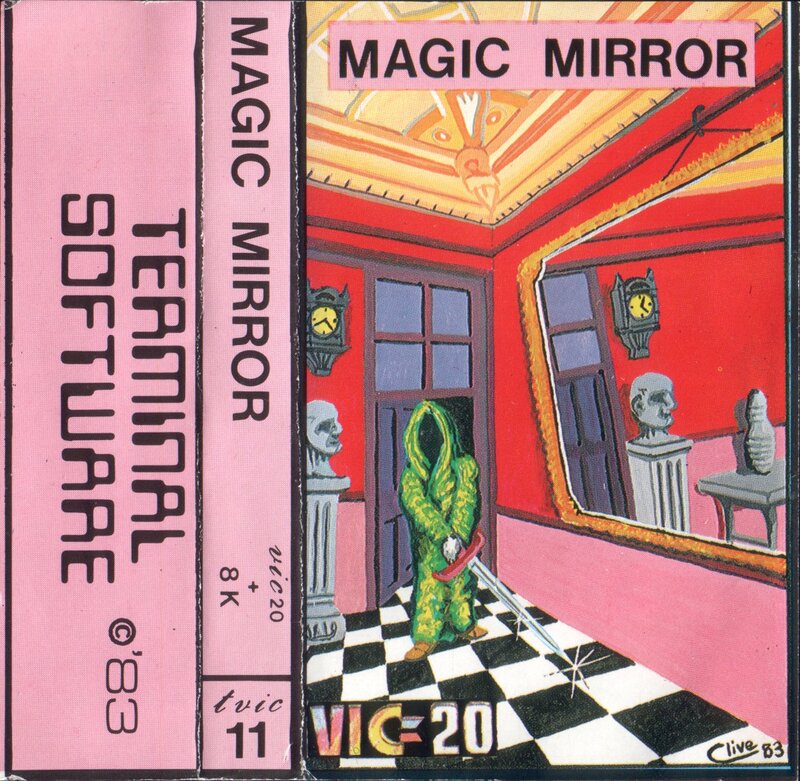 Things were so informal that when I wrote to Terminal Software to order a copy of their Skramble [local backup], I mentioned in passing that I had an adventure game for the VIC-20, and would they like to see it? They did. 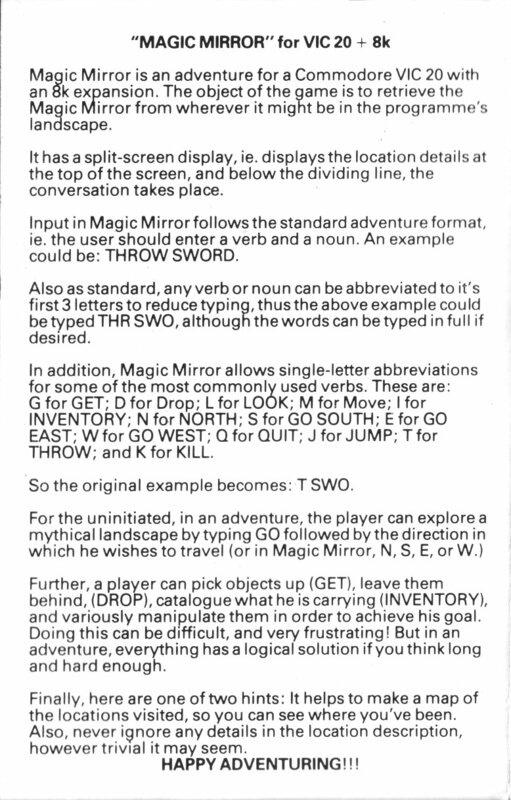 It had 38 locations and 45 objects, and very much the flavour of a Scott Adams game -- borrowing the Magic Mirror itself and other elements such as the chasm that has to be jumped from Adventureland. It began in a house, proceeded outside to a garden, containing a pond which you could swim down through into a cave. 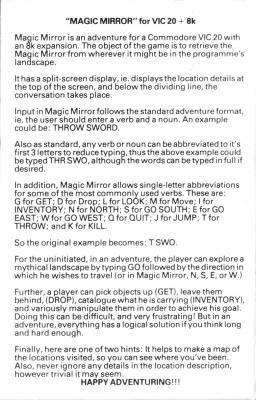 Looking back on this and other games, it's interesting to see how many conventions I unconsciously adopted from Scott Adams - things that I didn't even recognise as being stylised until years later when I played very different games such as the original Crowther/Woods Adventure. Unlike most of the games that followed, this had a ``save game'' facility, implemented by writing lots of randomly-named flag variables to a serial file. Amazingly, Nosferatu and The Causes of Chaos both lacked this. Magic Mirror sold reasonably well - about a thousand copies, I think -- despite the appalling artwork they provided for the tape inlay! In the wake of this, I was asked to do a Spectrum port, which I should have knuckled down and done -- the sales would have been much greater than for the VIC version -- but I couldn't get motivated about it. In fact, I never got very beyond writing the screen designer which I intended to use to build the loading-screen. So Mirror was only ever released for the VIC. The game itself, in a BASIC listing. 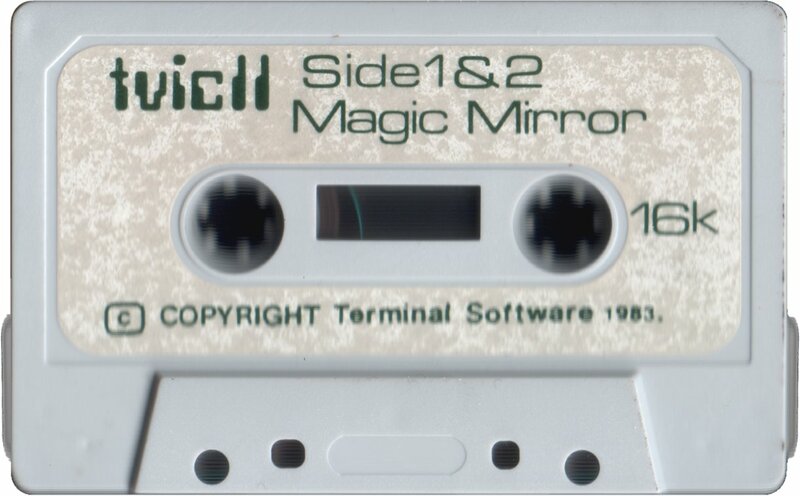 MAGICMIR.TAP, the tape image, which can be loaded into some emulators. 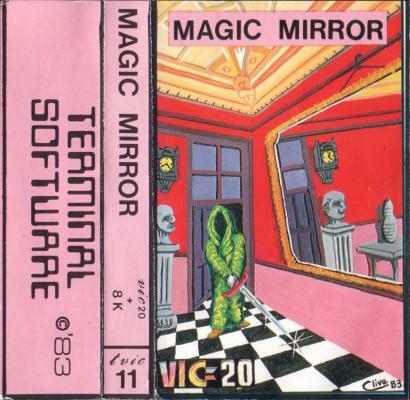 magicmirror.prg (supplied by Jacob Gunness, converted by Mat), the game file, which can also be loaded into some emulators: this is the version to use if your emulator supports it, as it's much smaller than MAGICMIR.TAP and loads much more quickly. My map of the game, drawn in raw ASCII. A much nicer and map, and solution, created in May 2009 by Michael Lambert of Sydney, Australia, and reproduced here with permission. Amazingly, in 2015, Dave Smythe made a working Python port of this 33-year-old game! Even more amazingly, in 2017, Carsten "SRS" Dost made an Amstrad CPC port, which can be run under WinAPI (for Windows only) or on JavaCPC. See also Carsten's own page. What I love about the game is the isolation it conjures up. It reminds me of Journey to the Centre of the Earth, where Arnie Saccnuson journeyed alone into the vast underground caverns. There was something eerie about floating in a small hide canoe on the vast subterranean lake inside a huge rock cavern with nothing but a torch to light the way.